Written by Catherine Saxelby on Wednesday, 16 August 2017. 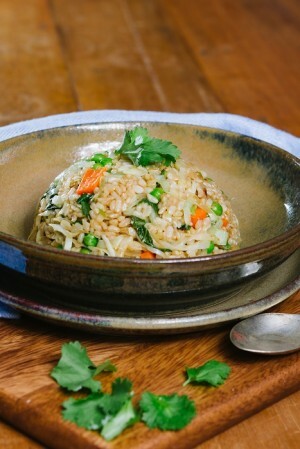 Here is a great way to use up any extra vegetables hanging around in your refrigerator and make fried rice healthier. It’s a mix-and-match recipe so feel free to substitute any vegetables you have on hand or what your family likes. I find you can add almost anything from capsicum to cabbage. For meat eaters, it’s nice to throw in a cup of diced, cooked chicken pieces with the peas at the end to create a complete one-dish dinner. My trick: cook the rice ahead and allow it to cool (or use leftover rice). I’ve used brown but the brown-haters won’t notice once the dark sauces are added! 865kJ (206 Calories), 7g protein, 10g fat (including 2g saturated fat), 19g carbohydrate (including 4g sugars), 6g fibre and 464mg sodium. Loosen cooked rice by running a fork through it. It needs to be separated and ‘flowing’. Break eggs into a small bowl. Add fish sauce. Beat with a fork until mixed about 20 seconds. Heat the sesame oil over medium heat in a small frypan. Add beaten egg mixture and stir gently, cooking until done, and make an omelette. Turn out onto a plate to cool (do not fold omelette). Dice. Mix together Stir Fry Sauce ingredients. Set aside. Heat 1 tablespoon oil in a large wok over high heat until just starting to smoke Add ginger, garlic and onion and cook, stirring gently, until soft and fragrant, about 1 minute. Add half of the rice and cook for about 3 minutes, stirring and tossing, until the rice is pale brown. Transfer to a large bowl. Repeat with another tablespoon of oil and the remaining rice. Transfer to the bowl. Add remaining oil to the wok. Add spring onions, carrot, cabbage, Bok choy, and cook, stirring gently. Add in 1-2 tablespoons of water. Toss well, cover and cook another 2-3 minutes. Add back in the rice and toss everything to combine. Add in stir-fry sauce and toss through until mixed thoroughly with vegetables. Cover and cook gently until rice is heated through, about 2-3 minutes. Add frozen peas and diced omelette and mix well until peas are just done, about 2 minutes. They will cook in the heat of the dish. Serve with coriander on top and chillis (if used) on the side. Carrots should be cooked but slightly firm. If you want, you can microwave them for 1 minute first to soften them a little. If you don’t use left over rice, make sure to let the cooked rice cool for about 30 minutes before starting. If cooking from scratch, start with 1 cup of raw rice.